Hello Foot, How Do You Do? 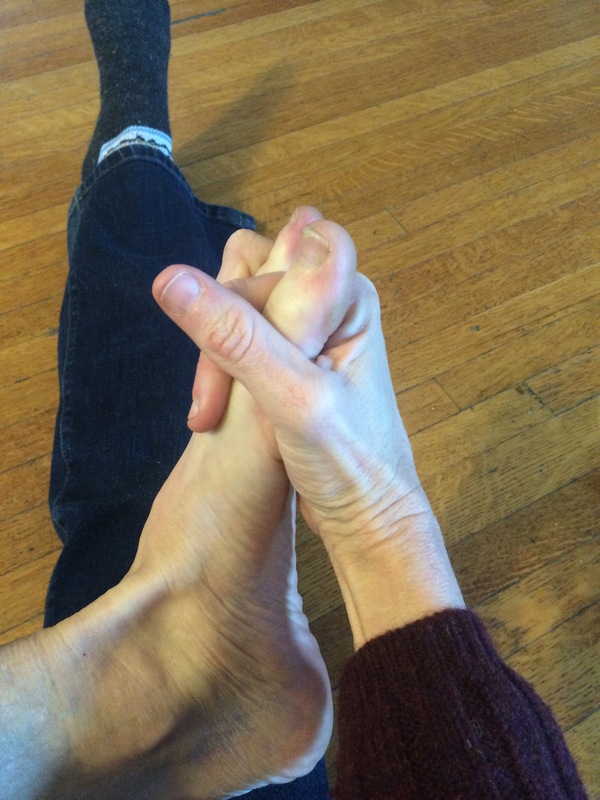 Have you ever shaken “hands” with your foot? Well, it’s time you did. Your toes have probably been casted into shoes all day – particularly shoes with tight toe boxes that don’t allow your toes much mobility. Remember, tight toe boxes don’t have to feel tight, as evidenced by the tracing I made of my foot from mat board last week. I was unable to slide it into one of my favorite shoes because it would not yield or deform as my foot does when I slide it into my shoe, demonstrating that my toe box, even though it feels comfortable, does not have enough room to house my foot in a healthy manner. Toe boxes that don’t allow full spreading of your toes will cause the muscles that bring your toes together (adduct) to be tight and weak and those that spread them apart (abduct) to lose function. Use your toe alignment socks when your are sitting/sleeping for passive stretching. But for active stretching, shake “hands” with your foot. Here’s how. Sit on the floor or a chair, bend your knee to bring your foot towards your trunk and face the palm of your hand towards the plantar (bottom surface) of your foot. Inserting my fingertips between my toes at the distal joints. Once you are there, clasp your fingers and toes around each other and commence to shaking and moving your hands to mobilize your toes. 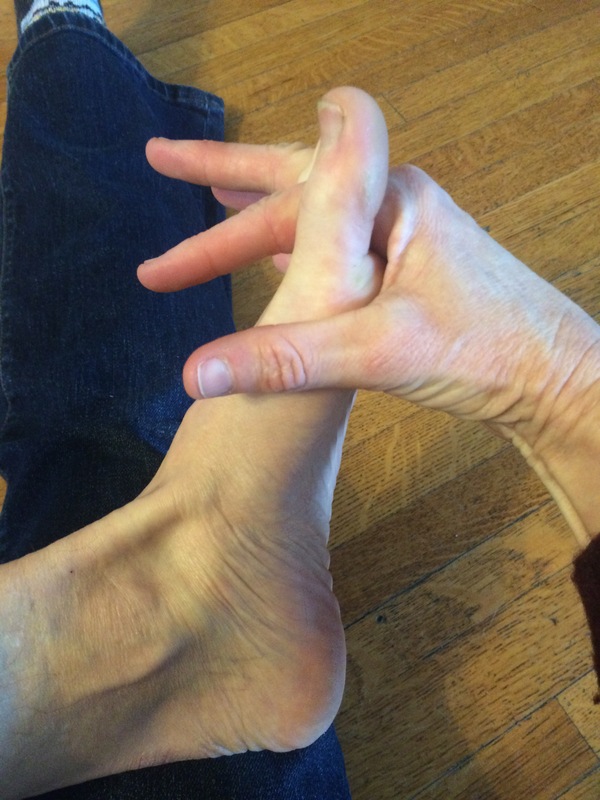 Since your other hand won’t be doing anything, use it to massage the arch of your foot. In the picture below, I’m using the same thumb so that I can take the picture, but its a richer experience if you use your free hand. On my Facebook page is a kind of ridiculous video of a hand/foot greeting. About halfway though, where my foot starts to spaz out, is where I stop moving my foot with my hand and instead let my foot move my passive hand. It increases movement nutrition. 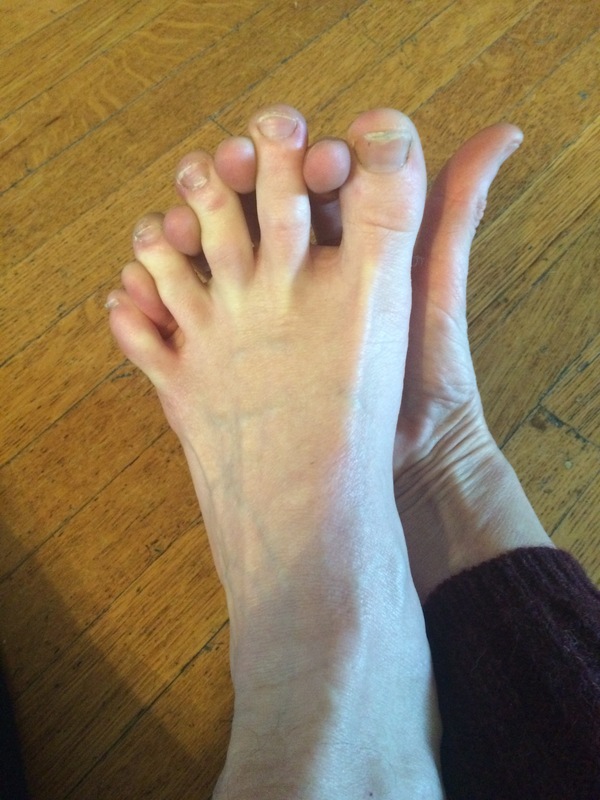 Holding hands with your foot is the first step in being able to spread your toes – using the strength of your toes to stretch your toes. Being able to spread your toes, using your own intrinsic foot muscles, is a healthy indicator that your foot is optimally innervated, meaning your muscles are actually firing as opposed to lying dormant and inert. Each time your spread, lift, and wiggle your toes, you are increasing circulation of tissue food (blood) and facilitating cellular waste removal. Good to meet you toes.